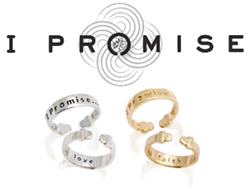 I Promise has launched a new line of customized rings to its personalized jewelry - offering a promise with every gift. For a limited time only, customers can receive 30% off all I Promise rings with the code NEWIPROMISERINGS at checkout. Sometimes it seems like there are no words that can tell our friends and family how much they mean to us and how thankful we are they are in our lives. That’s why I created I Promise. Jeweler I Promise is happy to announce it has added rings to its collection of customized jewelry. The rings, which feature select inscriptions or “promises,” are available on the jeweler’s website and at select retailers. Since its founding in 2015, I Promise has provided custom brass and sterling silver bracelets; the rings build on the legacy of quality and craftsmanship customers have come to expect. As an added bonus, to celebrate the new line, customers can receive 30% off all rings using the code NEWIPROMISERINGS at checkout. This offer is only for a limited time though, so act fast! The newly added customized sterling silver rings, crafted from plated brass in silver or gold colored finishes, are designed for both men and women. They are adjustable from sizes 5 to 8. Each is inscribed with the simple words, “I Promise” on the exterior. Customers can then choose which "promise" they want to wear, give or share. I Promise rings sell at an accessible $38 price point online, and the jeweler offers free shipping on every order… they promise. As customer Susan Santsche writes, the I Promise pieces “make an awesome Christmas gift to yourself or someone you love, honor, or respect.” Karen Rosengart and her team are committed to providing affordable gift options that convey heartfelt sentiments for every occasion. I Promise Jewelry, founded by Diamond Melee Specialist Karen Rosengart, creates custom I Promise bracelets that let you give your word and keep it forever. There are 12 I Promise bracelets, each with a different promise engraved on the inside, as well as the option to personalize your own. Each I Promise bracelet is carefully crafted in New York City with recycled 925 sterling silver and four conflict-free G VS1 diamonds weighing a total of 0.04 carats. Please visit http://www.IPromiseJewelry.com and “give your word” to someone you love. K. Rosengart was created in 2009, by diamond expert, Karen Rosengart catering to designers and manufacturers. Karen holds a Bachelor of Fine Arts degree from the School of the Art Institute of Chicago (SAIC). She also has a Craft Certificate in Jewelry from the City of Guilds of London Institute, and is a GIA Diamonds Graduate. K. Rosengart are diamond melee specialists, and treat their clients like partners. Visit K. Rosengart at http://www.krosengart.com.